Hang on to the sissy bar, we're goin' fer a ride! Highway 89A in North-Central Arizona parallels Interstate 17 between Flagstaff and Sedona, following the course of Oak Creek, down into the beautiful sandstone canyons characteristic of Northern Arizona. I recommend starting from Flagstaff and driving south to Sedona. There is a gorgeous overlook within a few miles of departing Flagstaff that provides spectacular views of the canyon into which you are about to descend via a series of wicked switchbacks. The drive to Sedona is less than 30 miles, but there are many points of interest along the way, and some delightful twisties to get you started. Slide Rock State Park is a great place to stop for a picnic, and during summer, to take a dip in the famous natural waterslides that occur here along Oak Creek. 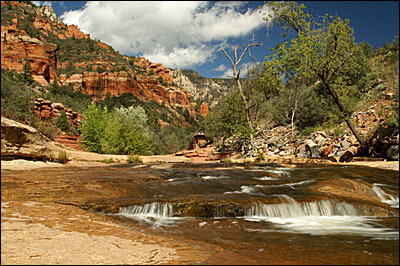 Further south, and to the west of Sedona, Oak Creek winds its way through another state park, Red Rock State Park. This park is located along the southern most portion of Sedona's famous Red Rock Loop Road, which also takes you past several beautiful red rock formations, including The Cathedral. Throughout the entire Sedona area, there are countless side roads of great scenic value (as well as driving enjoyment) that you can explore. 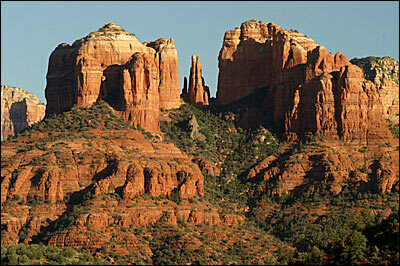 Sedona is loaded with accommodations for all budget levels (camping through five star resorts), and hundreds of eateries. At the junction of 89A and 179, there is a wonderful mexican restaurant, The Javelina Cantina: prices are moderate, but the portions are huge and the food excellent. 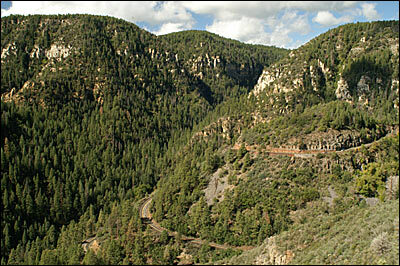 Drive south from Flagstaff on AZ 89A 14 miles to Oak Creek Canyon Vista and then 13 miles more to Sedona. Turn east 11 miles on AZ 179 to I-17 and then 40 miles back to Flagstaff. Alternatively, another way to complete the loop is to return to I-17 via Schnebley Hill Road rather than Hwy 179. The vistas along this rocky but rewarding forest backroad are as good, if not better, than any along the rest of the drive. Those switchbacks look like a lot of fun if you know your car, also look like a good way to get killed if you don't. Heh. I'll have to head down that way someday. Funny, the folks are headed down to Sedona as I type this to spend the winter (snowbirds). I might get a chance to check this out sometime soon. '79 924NA. Rebuilt 9.5:1, MSDS header, Mega Squirt Injection, MJLJ-EDIS Ignition, 1.6L Whipple Charger and Intercooler, 10lbs Boost, 944 Trans, Custom HD Clutch.